Japanese observers will attend Tuesday's military drill in Northeast China for the first time, in what experts say is a substantial step in China-Japan defense ties. Staff officer Okimura Yoshihiko and Tsubaki Yuichi, an army attach to China, will be guests at the "Warrior 2007" exercise, held on a training ground at the Shenyang Military Area. Analysts also consider the move a sign of the increasing transparency of the People's Liberation Army. It is a "tangible measure" of the strengthening military cooperation between China and the neighboring nations, said Major General Qian Lihua, director of the Foreign Affairs Office of the Defense Ministry. "There will be more partnership in defense and security between China and Japan," Qian told reporters yesterday. Vice-Chairman of the Central Military Commission of the CPC Central Committee Cao Gangchuan visited Japan from August 29 to September 3, becoming the first Chinese defense minister on such a trip since 1998, thanks to a recent thawing in Sino-Japanese relations. During the visit, Cao invited Japanese military observers to the exercise, as part of a raft of military exchange initiatives. Other joint activities will include a Chinese fleet visiting Japan at the end of the year and a later visit by a Japanese fleet to China, according to a joint communiqu signed between the two militaries during Cao's visit. "China's military transparency has been increasing, though we still hope it will become more transparent This is very important," said Yuichi. "I hope to take this opportunity to learn about the strengths of the People's Liberation Army (PLA); their battle capabilities and tactics." 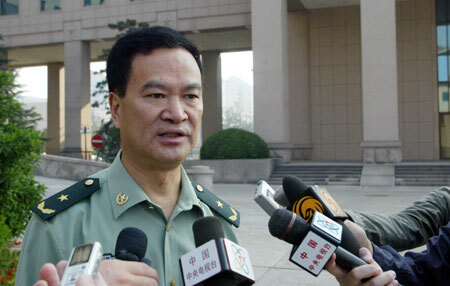 The exercise, involving more than 10,000 troops from a motorized rifle division, "does not have any political purpose, nor target any country," General Liu Zhenwu, deputy chief of the General Staff of the PLA, told the foreign observers at a meeting yesterday. Altogether 55 military officers from 35 countries, including members of the Shanghai Cooperation Organization, the Association of Southeast Asian Nations, and the United States, Germany and Australia, have been invited to the drill. The exercise aims to improve the PLA's battle readiness, provide an opportunity to share experience with foreign militaries and increase military transparency, Liu said. "It is open to military officers from more than 30 countries with a view to increasing transparency this is very necessary, as it helps reduce skepticism about our military aims, increase mutual trust and enhance international cooperation," Liu said. Since 2002, China has invited foreign military observers to attend military exercises on five occasions, but today's drill will have the largest number of foreign observers yet, said Qian. The observers were also yesterday invited to visit the Academy of Armored Forces Engineering, a prestigious military institute in Beijing.